The tank battery is the arrangement of storage and processing tanks, flow lines, and other equipment necessary to operate a well. Some tank batteries are connected to just one well, while others receive and process fluids from several different wells. When a single tank battery receives from a few different wells, those wells will usually all be close together which means they are all producing similar amounts and types of fluids. The different vessels and equipment that make up the tank battery will be chosen to store and treat the products from those type of wells. For example, wells in one area may be using hydraulic lift while wells in another use gas lift to up production. A tank battery will need to be equipped to handle the different requirements in each case. As the equipment chosen for a tank battery depends largely on what is being produced, it’s important to keep a number of things in mind when designing a tank battery for a particular operation. Obviously, it’s important to understand what each vessel does and how it does it. Understanding the interior layout of a vessel, as well as its place in the overall tank battery, is also vital. Most of all, you’ll need to be able to spot and solve problems you encounter, as a tank battery will most likely evolve over the course of its use. The composition of a tank battery will change and evolve over the life of the well. As the nature of production changes, different equipment will need to be brought in to meet different needs. Older equipment will be removed to make room. For example, a well may have sufficient natural pressure at first to produce a satisfactory flow. That pressure will fall, however, and eventually you may want to install a gas lift system, which requires specific, specialized equipment. Later, you may move to hydraulic lift, and have to add all of the equipment necessary for that. By the end of a well’s life, several different methods of production will probably have been used. There are a few basic things that most tank batteries will have. 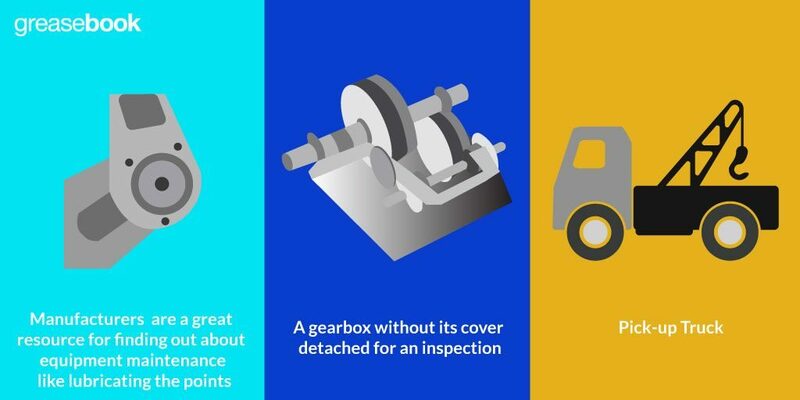 As each tank battery has to be tailored to the needs of the well and operation, it’s important to understand how each of the basic components works. Figure 1. 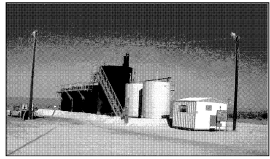 A picture of a tank battery that includes water tanks (painted black), a wash tank, and two stock tanks for oil (painted gray). Vessel is essentially a fancy name for the tanks and similar equipment that receive the produced fluid. 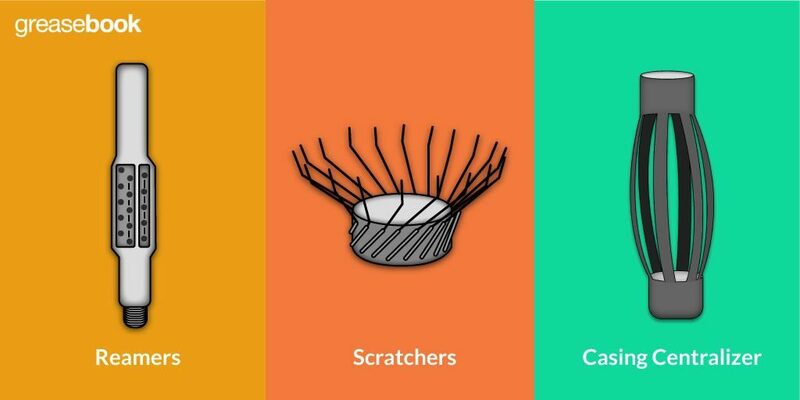 These are mostly used either to simply store fluid until it can be treated or sold, or to separate oil from water and gas. A stock tank is used for storing oil prior to treating or selling it. There’s also usually a tank for holding produced, separated water, as amounts have to be measured and recorded. These tanks are usually not under pressure. Tanks can be either round or rectangular. Rectangular tanks usually don’t have a roof. This makes it easy to access the stored fluid for measuring and testing. A ladder may come with the tank. However, as with all things when lease pumping, a bit of ingenuity may be required; you may have to put together a simple one to access the fluid. A hoop at the top of the ladder allows you to use both hands to test and measure fluid. A safety belt is another option. You’ll also need a separator, both a regular and a test one. This is usually the produced fluid’s first stop after leaving the well. 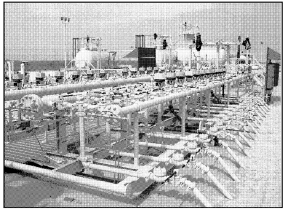 Most often these are two phase separator, meaning the vessel will only separate gas from oil and water. 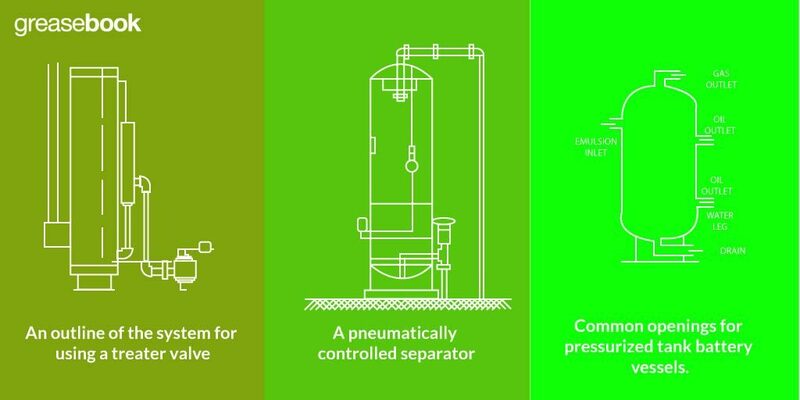 They can sometimes be three phase separators, meaning that it also separates the oil and water. Unlike stock tanks, separators are usually under pressure. Several vessels actually are involved in various steps of separating oil from other produced fluids and impurities. The heater-treater is another example, which is a three phase separator that uses heat. Heater-treaters can be either pressurized or at atmospheric pressure. A wash tank, sometimes known as a gun barrel, also separates oil from water and gas, making it another three phase separator. Just about every tank battery will need some sort of circulation pump. It can be one of a bunch of different kinds, and is used to move fluids from one vessel in the tank battery to another. Most tank batteries will require some sort of dike or firewall. These are required around vessels that are not pressurized, with fluids that are stored at atmospheric pressure. The firewall contains fluids in the case of leaks or other emergencies where oil may end up outside of a stock tank or other vessel. There’s some specific requirements regarding the size of the dike that you should check out. Usually, the dike has to be able to contain 1 ½ times as much fluid as can be stored in the tank. Lines can be simply be upset steel pipe like what’s used downhole. It can also be synthetic, like plastic or fiberglass. They can be joined however steel seems best for your operation. Steel lines can be threaded pipe and use appropriate fittings, or might use collars or grooved clamps. Synthetic lines are used frequently in situations where steel would corrode too quickly. Polyethylene lines are also popular for their low cost and ease of use. However, polyethylene lines are best used with low pressure wells. Figure 2. An example header. Head lines flow from the wellhead to the tank battery. When a tank battery receives fluid from several wells, you’ll need to put together a header. This is an assembly of lines and valves that allows you to control the flow from each well to the tank battery, as well as to other equipment such as a meter. In the example pictured, each well has it’s own set of flow lines and valves. Flow enters from lines on the bottom right. It then heads through a valve and then a check valve. Oil is then sent to different parts of the tank battery, either the production or test separator. All valves are quarter round valves, so it’s easy to see at a glance which valves are open, closed, and which wells have been shut in. Valves and lines are also clearly labeled. This sort of clarity is important to the efficient running of a lease. Figure 3. 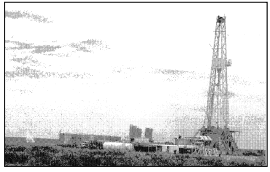 A drilling rig where a drill stem test is being performed. Gas is being flared off on the left. The very first oil drawn from a well will almost always be through the drill stem, and used for testing purposes. Rather than having a full tank battery for such a small flow, a smaller test tank is usually used. If the test shows that the well may produce a profit, a large bore pipe will be set in place to serve as casing and then perforated. At the same time, the tank battery should be assembled so that production can start as soon as the well is prepared. Some wells have sufficient bottom pressure to that flow will start as soon as the correct valve is opened. Other wells will require some further work. Many wells will have a column of water on the surface of the oil. The water will need to be swabbed out to so that the pressure in the tubing column is less that the bottomhole pressure. A column of oil can also be swabbed out to start flow. The first flow will often be measure by the drilling company, but it will ultimately become the responsibility of the operator to keep track of what’s produced from the well. Figure 4. 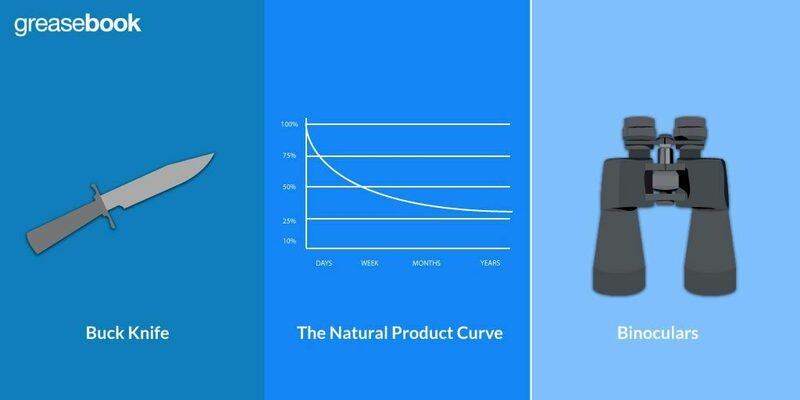 The Natural Product Curve. When a new well is opened for production, the pressure throughout the reservoir will be more or less equal. As fluid is drawn from the reservoir, the pressure around the wellbore will naturally drop. The oil in the reservoir will filter through the formation to the wellbore. However, oil will most likely be drawn much more quickly than it can flow through the formation, which leads to the drop in pressure. 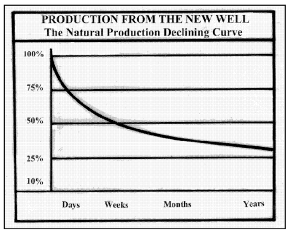 Over time, the production will fall according to the natural production curve. If no lift system is used, the production rate will follow this curve over time. 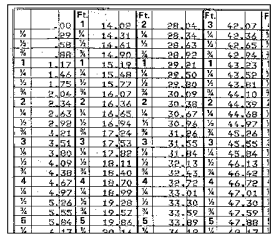 Many different factors will determine the actual numbers. Obviously, you’re most interested in the oil and natural gas that is produced from the well. However, you’ll be handling a few other products, some of which can also be sold to petroleum companies. Asphalt is used in road construction. Natural gas can be used in several industries. Paraffin and petroleum are also valuable byproducts. BS&W, or basic sediment and water, is going to be the biggest byproduct by volume. Water can be used for some pumping operations, but there’s a number of byproducts which can be difficult to deal with, if not dangerous. Sulfur is often found in wells, which, when combined with produced water, can lead to the formation of acids that cause corrosion. Hydrogen sulfide can be particularly dangerous, and proper safety procedures should always be followed. For lease pumpers, specifically, those procedures should never be ignored, as you’ll often be working the lease solo. Figure 5. An example tank chart. You’ll be required to keep precise records about the well’s production, breaking down the volumes of natural gas and oil, as well as water. These records are required by a variety of regulations, and are reviewed by regulatory agencies. For any given well, the very first production will be recorded, as will all production up to the end of the well’s production lift. A yearly, weekly, and daily report is usually required. These records are actually useful for the lease pumper as well, as they can be a guide to the amount and type of equipment needed to fully exploit a well. That decision will also be affected by many other factors, such as the volume of oil coming from the well, the lease size, and financial considerations. Fluid volumes should be measured frequently throughout the day when the well first is flowing. Record keeping usually begins at the wellhead, and a basic meter is usually installed there. More detailed records can be taken from the various tanks that make up the tank battery. The use of a gauge line paste will help in determining the ratio of oil to water. While gas is usually vented to the air or lit to form a flare, the amount is still needed to be measured and recorded.